Photo: ACEA / Gilles Martin Raget. 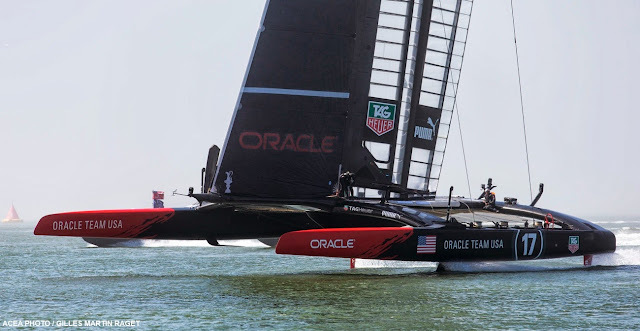 | This is getting nasty for New Zealand, Oracle is doing one of the most hard tasks imaginable to achieve an already historic comeback beyond the final result. They have re defined stable foiling all together, plus they have smashed TNZ speed upwind. This a 180° turn from what we saw in the first two races. With an inferior boat at that time Oracle managed though to score some wins and later also lost some on their own fault. Progressively they gain speed and improved tacks. All being said by now, but the guts this team is showing is beyond belief, the whole Oracle shore , design & sailing crew are graduated comeback specialists. Now New Zealand is fighting with a 'handicapped' solid boat , upwind OR does +31 and they do 25-26, although with cats that is not even definitive as seen today. What the high brains of the anti Multi camp didn´t realized when saying cats would have great separations due to their speeds was that they just didn´t took account on the fact you can recover in the same way from behind, thus making a perfect scenario for lead changes and great recoveries, something literally impossible in monos as no matter how hard those boats can push performance around, there is a too small speed limit and range to play with. Today was faster again, but it was not easy, the Kiwis were 700mts behind and end with a too small 100-150 gap, the key was Oracle doing no errors, TNZ would have passed them if so. With cats you have a broader range that is given by your handling and tactics, at the same time you can have a boat going 25 knots and the other doing 15.... the key is you can switch this same situation just like that on crew errors or wind shifts/holes etc. To tell you the truth I just don´t know what else to write regarding the benefits and excellence of racing Multis at any level but specially at the Americas Cup. Next Cup can be raced in Volvo 65s, I couldn´t care less at this moment, this Cup Edition will live in our memories till the of times... !